One of the tree fruit industry’s newest technologies is making its debut—amazingly—in a five-acre maze shaped like an apple and created, not out of corn, as most mazes are, but of apple trees. Mazes are popular attractions. But how would one manage an orchard with all the twists, turns, and dead ends of a maze, especially the spraying? That’s the clever part. Instead of having to wend their way down alleyways with conventional equipment, the managers of this new orchard will spray it with a permanent fixed-in-place system exactly like the one called the Solid-Set Canopy Delivery System. The SSCD system is being researched at Washington State University, Michigan State University, and Cornell University. It looks so promising that some growers are ready to go with it right now. 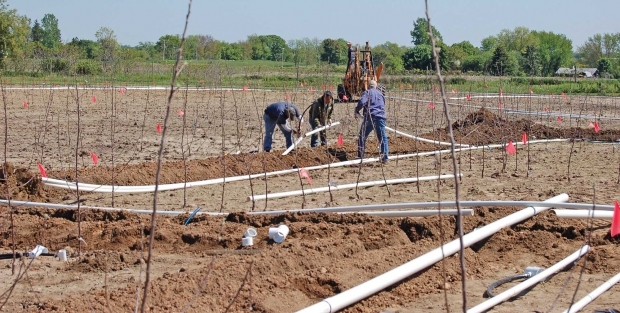 The system going in at Royal Oak Farm Orchard was designed by John Nye at Trickl-eez Irrigation in St. Joseph, Michigan, the same person who put together the array of plumbing lines and spray nozzles in the researchers’ experimental orchards. Dennis Norton, Paul’s dad, said that when customers come to Royal Oak Farm Orchard, their goal is more than just to buy fruit. They want to “make a day of it.” They drive 45 minutes, if they come west from ­Milwaukee, or two hours if they come northwest from Chicago, to visit the farm on the Illinois-Wisconsin line. They come to pick their own fruit, eat lunch at the restaurant, shop at the market and bakery, and engage in family activities such as hay wagon and carousel rides. Kids feed and pet animals in the petting zoo, play on playground toys, and engage in other activities that make Royal Oak an agricultural entertainment destination. Starting next summer, visitors will be able to stay another couple of hours and find their way through what is likely the country’s only maze made of apple trees. A-Maze-N’ Apples is in the final stages of growing, with spray lines to be installed this summer, and it will open in late summer of 2015 as a combination maze and you-pick orchard. People will pick the apples and carry them out through the winding corridors. Luckily, there are shortcuts so apples need not be carried the full two miles of the total maze. 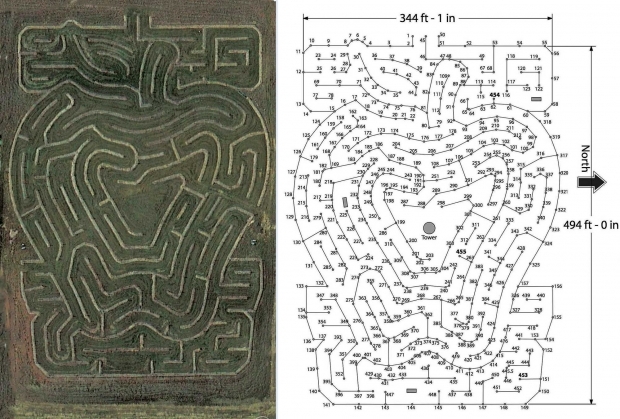 The maze was designed by Maze Play, the company that also designed the 33-acre corn maze at Richardson’s Adventure Farm in Spring Grove, Illinois. Maze Play created the apple shape using a computer program and provided GPS coordinates so Royal Oak employees could place each of the nearly 3,000 trees (in nine varieties) that make up the maze. Royal Oak was founded by Peter and Gloria Bianchini in the early 1990s. Dennis Norton married their daughter, Renee, and they liked the farm so well the couple joined in the operation about 15 years ago. Their son Paul and daughter Sarah, and their spouses, joined in, and now Paul and Meghan have six young children, and Sarah and Justin have one. 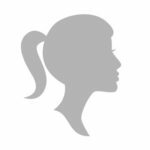 All are involved in the business, living in four homes on the farm property. The farm grows apples (16,000 trees in 30 varieties), peaches (300 trees), and 15 acres of berries and pumpkins. Some produce is sold prepicked, especially peaches or the most expensive apple varieties like ­Honeycrisp, Zestar!, and Pristine. “On a good Saturday, we’ll have four or five thousand people here picking apples,” Dennis said. The farm has a large complex of buildings that include the Harvest Barn, which is you-pick headquarters; the Apple Barn where apples, pumpkins, gourds, squash, and a few other vegetables are sold; a barn where apple cider is made; a restaurant and bakery; and a pavilion that can be booked for weddings, birthdays, or other events. School kids watch videos before taking orchard tours. “We’ve very much involved in educating the public,” Dennis said. Paul described the overall maze as being about four and a half acres and nearly square. From the air, it looks like a classic Red Delicious apple with some leaves at the stem end. The nine varieties of apples were planted in several groups so that when a variety ripens, there are three or four areas where they can be picked. The nine varieties in the maze, all planted on Malling 26 rootstocks, are Blondee, Snowsweet, Zestar!, Royal Court, Empire, Smoothee (Gibson Golden), Grand Gala, September Wonder Fuji, and Granny Smith. There are about two miles of paths, and it could take two to three hours for those who choose to “pick” their way through the whole maze, he said. There are benches and rest areas. When the maze was laid out, the first thing installed was the main underground pipe system that will bring spray material to and from the orchard. Then the trees were planted, following carefully drawn, curved lines. Then 456 posts went in and the first trellis wires were installed. Trickle irrigation lines were laid beside the tree rows, and then landscape fabric was placed for weed control. Mulch will be laid over the fabric. The idea was to avoid having to apply herbicides for weed control and to provide a good grassed orchard floor for you-pickers to walk on. Everything will be mowed for easy foot traffic. Paul admits mowing a maze isn’t easy and the employees are using maps to make sure they don’t forget any areas. The alleys are fairly uniform in width, but they vary somewhat from eight to twelve feet, Paul said. Trees are three feet apart. The whole notion of mazes developed years ago in Europe, and mazes there were made of trees planted in hedgerows. It was an American idea to plant corn and cut the maze pattern into the growing corn with mowers. The Royal Oak plan follows the European model, based on dense walls of perennial plants. The apple trees will be trained to the ancient Roman system called espalier. The trees will be pruned and fastened to a wire trellis to keep each row dense but narrow. “The trees will be trained to grow more horizontal,” Paul said. He expects a dense foliage wall, two to two and a half feet thick, fixed to four trellis wires spaced at one and a half feet apart, with the hedge maintained at seven feet tall. “We’ll probably get 10 to 15 percent lower production than we’d ideally like,” he said. Pruning will be done by hand, but Paul believes the system may respond to mechanical hedging. He has a row of espalier trees elsewhere on the farm, planted to test it out. Visitors will not see the spray system in operation (see “How the maze will be sprayed”). Codling moth pressure has been minimal in the second generation, he said, and apple maggot is sprayed for when it shows up in late June or early July. Sprays to control apple scab are applied early and are not needed after petal fall. They use a program called Biointensive IPM, which seeks to minimize pesticide use and employ biological strategies whenever possible. “We’re also willing to take some fruit loss,” Paul said. Royal Oak also keeps bees and sells honey at the market, and they believe the health of their bees is a testament to how well their pest management program works. There’s no entry fee for visitors who come to Royal Oak, and the entertainment area, including the petting zoo, the playground equipment, and the picnic area, is open to all. 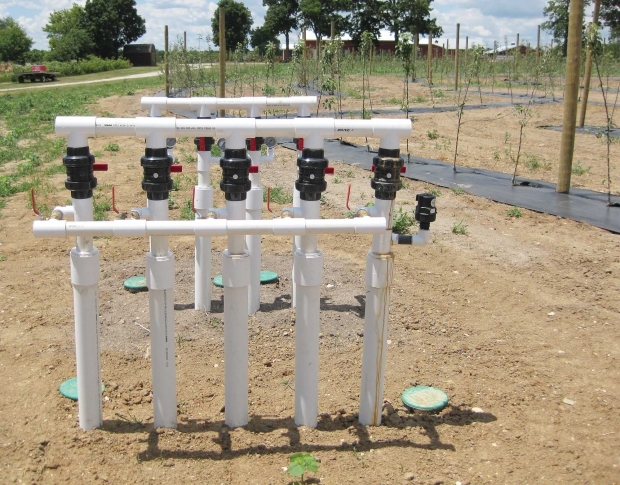 John Nye, who owns Trickl-eez Irrigation, Benton Harbor, Michigan, does the irrigation work at Royal Oak Farm Orchard, so it is not surprising the owners were following his work with the experimental Solid-Set Spray Delivery System. They wanted to put it into their plan for a maze made of apple trees. Nye described how the system works, step by step. The system starts with a trailer that carries a small engine and a pump, a tank for spray material, an air compressor, and a line to hook the spray tank to a manifold at the edge of the orchard. There are two manifolds that serve the four-plus-acre maze. The manifolds are the entry points bringing spray solution into underground piping that carries spray to risers. There are eight risers, each serving about a half acre. The risers take the spray solution to flexible plastic lines fastened to the top trellis wire. On each line, there is an emitter—an irrigation-style spray head—every three feet. One of those sprays downward. The next one is a double spray head on a hanger that drops it lower in the canopy. “Above every spray head is an LPD (a leak prevention device) that is a check valve that won’t spray until a critical pressure is reached,” Nye said. These are set at 35 pounds per square inch. 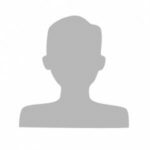 “The pump on the trailer delivers enough spray material, at pressure kept below 35 psi, into the polyethylene supply lines to fill each of the small reservoirs located above each emitter. Compressed air, again kept below 35 psi, is used to push any extra spray material not needed to fill the ­reservoirs back to the supply tank,” he said. The pressure from the air compressor is then raised above 35 psi, at which point all the emitters open simultaneously. Spraying takes place for ten seconds, emptying the reservoirs. The pressure is then reduced below 35 psi, and the emitters close, Nye said. It takes less than three minutes to spray a zone, and the system can do two zones at a time, so total spray time for the whole maze is less than 15 minutes. Add another 10 minutes to move the trailer from one manifold to the other and the entire acreage is covered. For more information about Royal Oak Farm Orchard, visit its website, www.royaloakfarmorchard.com. Videos on YouTube show phases of the maze’s construction.